Well, the pictures below are all different but, like the comic-book features, confoundedly similar. Every one is a different staircase in Bellagio. The town of Bellagio is built on a hill. There’s an elegant neighborhood down on the waterfront with hotels and (expensive) gift shops; and up on the hill where we live, another neighborhood filled with apartments, bars, and (expensive) gift shops. Between the waterfront and our “uptown” neighborhood, stairs. Lots of stairs. I photographed thirteen stairways this morning; there are no doubt more. Every one – every one – is paved with river rocks. Not cobblestones: rocks. There must be an ordinance. No concrete; gotta use rocks. No one walks in their bare feet in Bellagio. What great pictures! You should have cards made of them. I bought some once of different doors but I love the stairs of Bellagio. Bella means pretty. What does the “Gio” part of it mean? I love these! Bet no one (at least no one in their right mind) wears heels either. Point well taken. We saw plenty of heels in Spain, not so many in Greece, and none in Bellagio. Lots of wedgies, though! Great stuff Tom. Could “gio” (geo) mean earth, land, that kind of thing? The place certainly doesn’t appear to be “undone” any longer! Lovely, Tom. I like them all. And the time it takes to climb them. There are certain things that set a pace of life. This is one. Indeed. I knew you’d like them. very good exercise !! you don’t need to go to the gym ! Which is a good thing, Mapi. This isn’t the mind of place with gyms nearby. But yes : we figure three or four hikes up steps a day is worth a forty dollar gym membership, easy. I always enjoy a drink in the Sports Bar/Gelataria when I reach the top of those steps. Bellagio has a special place in my heart. I envy you being there now. Thanks for the comment, Paul. In fact, we had a beer there last night. Have you ever noticed the canaries on the balcony above? There must be a dozen of ’em. Wonderful! I love how you take a little part of expat life and comment on it…those simple things that tell the stories of where we live. Thanks. Thanks, KP, although the stairs in Bellagio hardly qualify as a “little part” of life. After three weeks there, we had thighs of thunder. 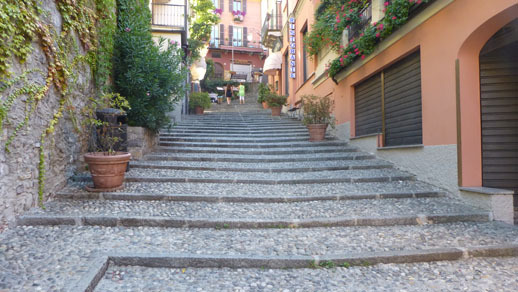 No matter where you go in Bellagio, it’s either up or down, never flat.